Stop The Itch ! ! ! Do insects make you or your dog, horse or cat scratch? Nobody likes to be around a stinky and itchy dog. 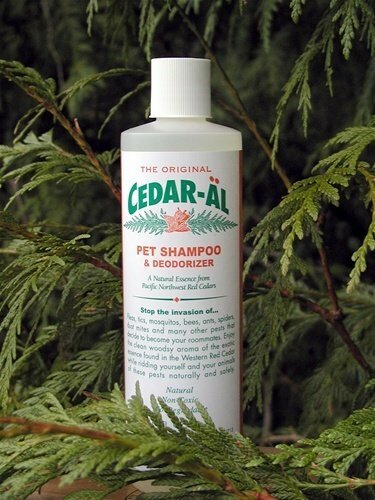 Stop the itch with CEDAR-AL Shampoo! Our shampoo has a natural exotic essence, pure, gentle Castile Soap, to soothe dry itchy skin, and scented with Pacific Northwestern Red Cedar oil to keep your pet's coat shiny, fresh smelling, clean and flea-free; natural, non-toxic, bio-degradable, and less expensive than "Frontline and Advantage." Enjoy the clean woodsy aroma while ridding yourself and your animals of these pests naturally and safely. Aloe Barbadensis Leaf Juice (organic)*in a bath of water……….aloe barbadensis is nature's miraculous gift for everyday skin and hair care. Aloe is a powerful moisturizer, which penetrates the skin supplying moisture directly to the tissues. It is renowned for its soothing and calming effect. Aloe improves skin tone and color by increasing the blood circulation. It reduces skin redness, and displays a synergistic effect with the other anti-inflammatory ingredients. Aloe Vera includes an enzyme that is beneficial in stimulating new hair production. Aloe is a natural remedy for hair loss that has existed for ages. Aloe Vera is used by many different cultures to stimulate hair growth. Aloe Moisturizes, cleans, smoothens, and softens the skin. Prevents wrinkles, keeps the skin fresh, young, and gives it a healthy glow. Protects your scalp and hair from the after effects of sunrays, dust, smoke and smog. Sodium C14-16 Olefin Sulfonate..........is a unique, high performance anionic foaming agent. Helps with viscosity and foam characteristics, as well as improved mildness. Safe surfactant used in rinse able bath products. It is also readily biodegradable. Cocamidopropyl Betaine..........a sulfate free blend that is mild to the skin and hair. Naturally derived from coconut and palm oils this effective cleanser will not strip color from the hair or dry the skin. Sodium Laureth Sulfate………. readily biodegradable surfactant without sacrificing critical performance attributes, such as foaming and viscosity response. Its low irritation properties make it ideal for mild cleaning. Peg-150 Distearate..........a non-oily emulsifier, emollient that helps to moisturize the skin, while adding volume and natural body to the hair. EDTA.......... In cosmetics and personal care products, this ingredient is widely used to bind to metal ions, which inactivates them. The binding of metal ions helps prevent the deterioration of cosmetics and personal care products. It also helps to maintain clarity, protect fragrance compounds, and prevent rancidity. Citric Acid……….a natural extract derived from citrus fruits, it is a widely accepted organic acid used in the cosmetics and food industries as a preservative and a pH control agent. It has antioxidant properties and is used for product stabilization. Sodium Benzoate and Potassium Sorbate ………multifunctional preservative blend that uses naturally derived raw materials. This multi-functional blend offer’s moisturization benefits while keeping the product free of microorganisms. Naturally safe and efficacious preservative system that can be used throughout the global market. Use in combination with the CEDAR-AL Cedar Oil Spray to give you and your pets a pest free environment. Our 12 fl. oz. bottle contains the finest shampoo available! 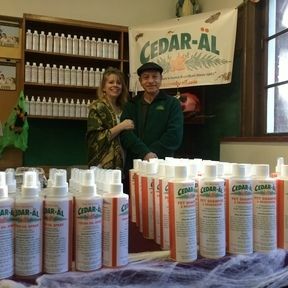 Get ready for visitors with CEDAR-AL ! Give cedar as a gift to use year round. Learn many other ways to use our cedar oil shampoo on you, your family, and your pets in our How to Use article.